A few weekends back, I traveled to Orlando for a belated 10 year high school reunion. Being the product of the late 80’s/ early 90’s that I am, the words “high school reunion” bring me mental pictures of Lisa Kudrow and Mira Sorvino dancing to Cyndi Lauper’s “Time After Time” in their Easter egg-toned lamé outfits just before they fly off via helicopter into the sunset. I’m completely unashamed to report that “High School Musical” also comes to mind, and I seriously (and not so secretly) wish that Zac Efron and Vanessa Hudgens would reunite down the road for their own musically-inspired version of a reunion. At what age is it inappropriate for me to admit things like that? From what I’ve gathered from movies, television, and limited personal experience (all legit sources, right? ), reuniting with friends from your past can be terrifying for a lot of people, and understandably so, given that the teenage years are often flooded with a crap-shoot of drama, hormones, bullies, and insecurities. So naturally, leading up to this weekend, I thought a lot about the past, listened to a bunch of old burned CD’s, and even looked through a few photo albums from my pre-college years, trying to prepare myself for whatever the night may entail. Even on my way to the reunion, I half expected fear to rear its ugly head along with a million and one of my petty insecurities. I’m happy to report that the evening was splendid. I’ll attribute a majority of the painlessness to the fact that I had a truly enjoyable and relatively easy high school experience, marked by loads of fun memories and only a smattering of truly heartbreaking and cringe-worthy ones. Only a handful of people showed up to the dinner gathering, but that kept an element of intimacy, relaxedness, and fun that a larger party of people perhaps would have squashed. It definitely helped that I had my high school and current best friend, Jesse, there as the ultimate wingman/sidekick, but the rest of that lack of anxiety, I have decided, can be attributed to newer attempts I’ve made to genuinely be OK with the person I am right now. This has been one of my goals for 2016: Being OK with me. I want to be truly content with my life. I want to be proud of who I am. I want to be confident in what I can offer. 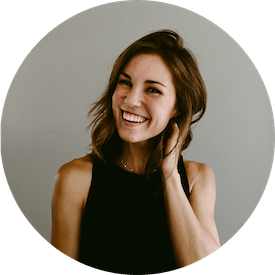 I want to walk through life free from shame of who I’ve been or fear that I don’t measure up. I want to be excited about my life and feel free to relish in the million things I have to be joyful about. I want to know and believe that who I am and what I have is enough, this year and for another ten years. That’s the person I want to be. Admittedly, I have a long way to go. But that’s why it’s a goal and not something I’ve already checked off my list. It’s something worth striving after. Another something worth striving after? Perfect banana cream pie. Have you ever made a cream pie from scratch, only to have it fail to set up and turn into a sloppy tin of pudding? Well, I have. That’s just about every cream pie I’ve ever made. That is, until recently. I ran across this recipe in Cook’s Illustrated and decided to try a variation of it. This recipe uses less liquid than others I’d tried in the past, so I was pretty optimistic that this could be the makings of a winner. It did not disappoint. And because I was feeling extra jazzy, I added an additional layer of bananas AND a cookie crumble crust. Mercy. I’m planning to attempt converting this to a coconut cream and chocolate cream pie recipe in the near future, so cross your fingers, legs, and whatever else in hopes that they are as successful as this bad boy was. 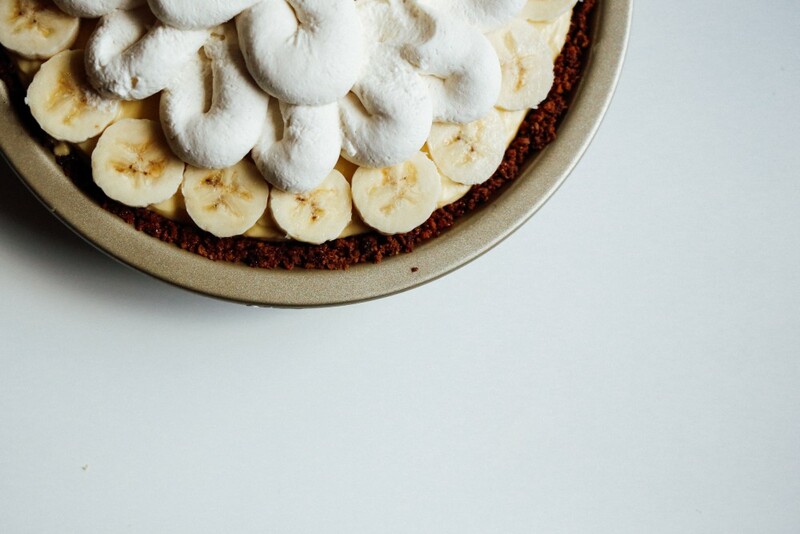 And if your sweet tooth is calling your name this week, you should make this pie. You should also probably rent “Romy and Michele’s High School Reunion” and cry laugh while you eat it with someone awesome… bonus points if you’ve been friends since high school. 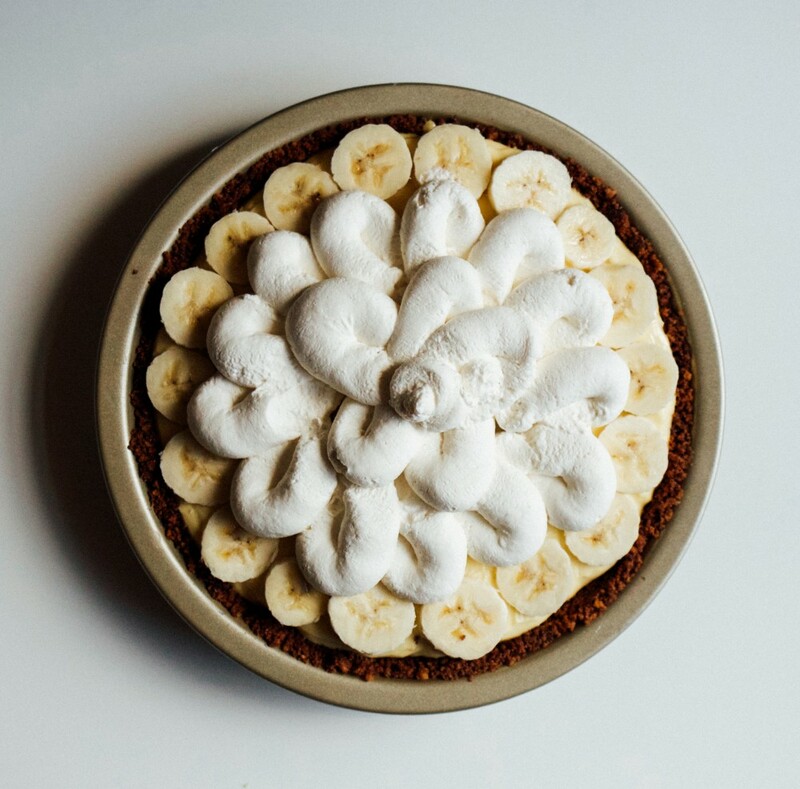 A traditional banana cream pie made special with an oatmeal cookie crust. In a food processor or by hand, finely chop cookies/crumbs into a coarse consistency, adding the remaining crust ingredients towards the end. Mix to combine. The mixture should resemble wet, coarse sand. Bake until the crust begins to firm up, about 8-10 minutes. Allow to cool. Whisk the sugar, cornstarch, and salt together in a medium saucepan. Whisk in the egg yolks, followed by the heavy cream and milk, until the mixture is smooth. Over medium-low heat, bring the mixture to a simmer, whisking constantly. The mixture will slowly thicken to a loose pudding consistency. Be sure to whisk constantly while mixture thickens, otherwise you will have clumpy pudding as opposed to a uniformly smooth pudding. Remove the pan from heat and stir the pudding through a fine mesh strainer to remove any clumps. Return the mixture back to the pan, but off the heat, and gently stir in the butter and vanilla. Allow mixture to cool slightly, stirring once or twice a minute, for about five minutes. Thinly slice (about 1/8th”) a layer of bananas over the bottom of the pie crust. I used about 3/4 of a banana for this. Spoon half of the pudding mixture on top of the banana layer. Repeat the layering of banana slices once more, topping with the remaining pudding. Smooth the top and place a piece of Saran wrap directly on top of the pudding. Allow to cool in the refrigerator at least for 4-5 hours, but preferably overnight. When ready to serve, whip the remaining heavy cream with a hand or stand mixer, starting on low speed and increasing to high. Add sugar along the way and turn the mixer off when stiff peaks have formed. On low, stir in the vanilla until combined. 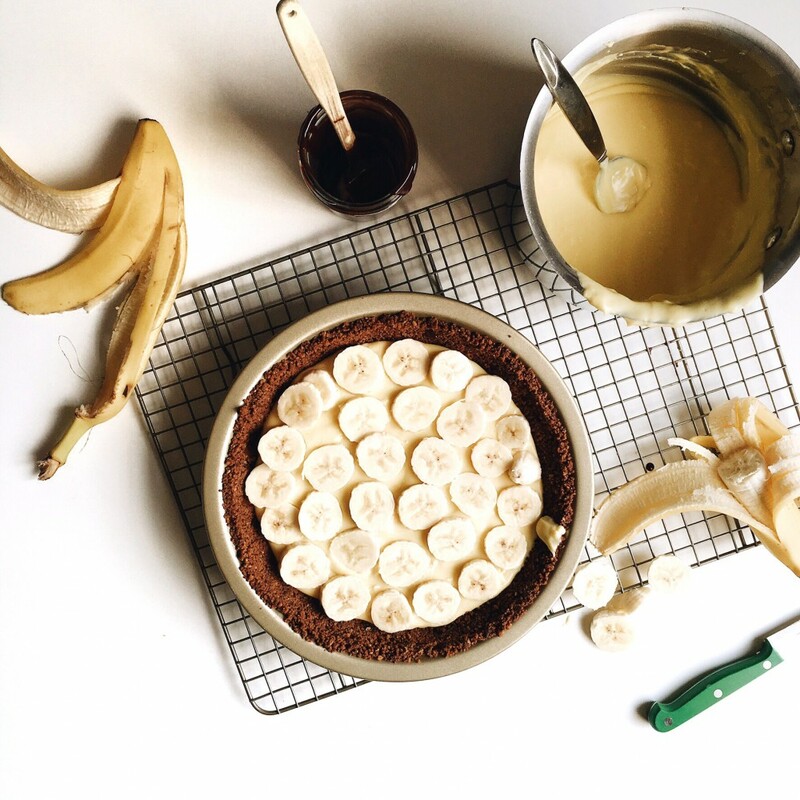 Keep pie refrigerated until ready to serve and garnish with extra banana if desired! Cooking your filling enough is really important. You’re looking for a consistency similar to a loose pudding. It will thicken slightly as it cools, but you don’t want to quit the cooking process while the filling is still soupy. Try to avoid over-stirring the filling after it has been cooked. This can cause it to loosen up. Before decorating, I sliced the remaining banana slices and put them in a bath of one cup of water and the juice of half of a lemon. 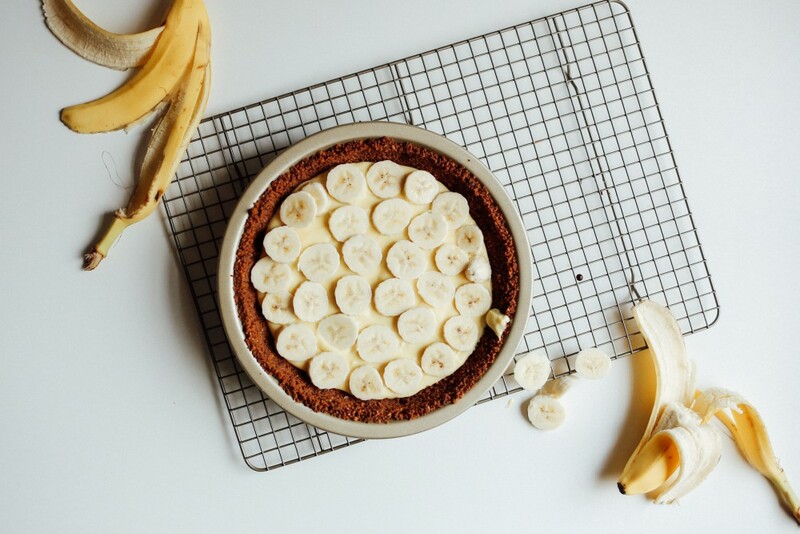 This will slow the browning process and allow you to decorate with bananas a little ahead of time. Note that bananas will still brown slightly given enough time. Hi Kate! 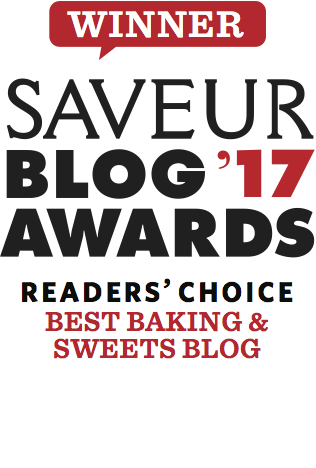 I love your blog and you’ve inspired me to get into baking! I plan on making this for my mom for Mothers Day, I’m wondering if there’s another brand of oatmeal cookies you’d recommend. I live in a small town in Wisconsin and can’t find the GMommas cookies anywhere (I wouldn’t Get them on time if I order them online either). I’m thrilled to hear this! What a kind gift for your Mama! Thank you so much for sharing this recipe! The pie turned out amazing and everyone LOVED it!! What a great goal! I should definitely work on that too 😉 I guess I could do that while eating a huge slice of this pie! This flavor combo is perfect! Let’s be honest- I’d eat just about anything in this crust. Let me know how it turns out! I am going to try this for sure! I know my dad would love it. I highly doubt it will disappoint- especially since you have easy access to GMommas too!